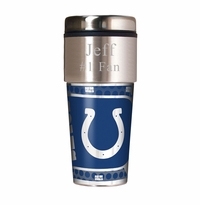 DETAILS: Insulated to regulate temperatures, these mugs are printed in your favorite NFL team available. Personalize with 2 lines of text allowing a maximum of 10 characters per line. 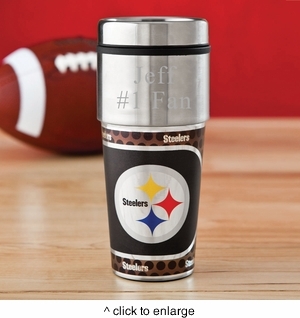 SIZE: The tumbler measures 3 1/2" x 8" and holds 17 ounces. PERSONALIZATION: 2 lines, up to 10 characters per line. TEAMS AVAIL. : Avail. in teams listed only. 49ERS BEARS, BRONCOS, COLTS, COWBOYS, DOLPHINS, EAGLES, GIANTS, PACKERS, RAIDERS, RAVENS, REDSKINS, SEAHAWKS, STEELERS and VIKINGS. *NOTE: Any images shown are subject to change as NFL teams change the 'artistic look' of individual team logos at-will. We do not have individual team images at this time.